I met Melissa Ybarra, designer of Iza Pearl, as I was walking around at Quilt Market last fall. Her darling booth and presentation stopped me in my tracks. 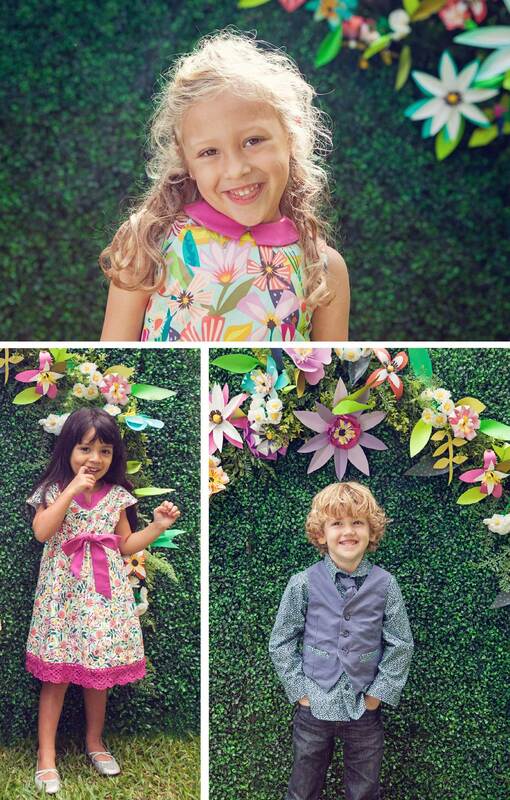 Melissa’s new fabric collection, Garden Party Tango, (and no, I didn’t even make the connection between the name of her fabric collection and our new Garden Party Dress until just now) works so beautifully with Oliver + S patterns! Melissa agreed to tell us a bit about her new fabrics, and she’s even hosting a very generous give-away of her fabrics! Read on for details. Here’s Melissa. Let’s face it, old man winter has completely overstayed his welcome in most parts of the country this year. But finally, little glimpses of spring, sunshine, and warmer days are popping up and bringing hope of sundresses and picnics and chasing butterflies barefoot. Garden Party Tango is the perfect collection to celebrate spring and all its loveliness! I designed Garden Party Tango last April when, in Texas anyway, everything was blooming. The tulips at the park, the massive spreads of blue bonnets along the highways, and the crate myrtle trees that line my neighborhood streets were all shining in full floral glory. Spring has always been my favorite season, and it seems to show in my artwork. I love everything about it–the colors, the sense of freshness it brings, and the fabulous flowers and tiny buds in every shape and size that seem to be dancing everywhere. It’s always sunny and 77 degrees in the land of Iza Pearl. 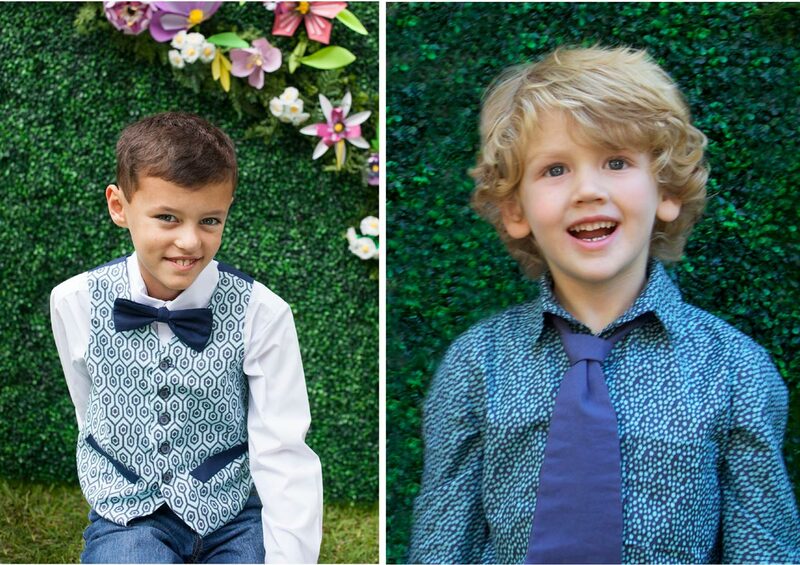 I have always been a huge fan of Oliver + S’s adorable patterns. I love their fresh twist on classic styles, and knew that I wanted to use their patterns for my Garden Party Tango samples for market. I was over-the-moon pleased with just how well Oliver + S and Garden Party Tango danced together…the results, a perfect 10! So to help you and your little ones get ready for Spring and get your tango on, we are giving away five yards of Iza Pearl Design’s Garden Party Tango (in any 1/2 yard combination of prints) for you to whip up your favorite Oliver + S ensembles! To enter, leave a comment below telling us your favorite thing(s) about Spring. Comments will close at 9:00 AM ET Friday, April 4, 2014, and we’ll select a winner at random. The winner will be notified by email, so there is no need to subscribe to comments on this post to find out if you won. We’re only able to ship to addresses in the United States, so entry is limited to US residents. 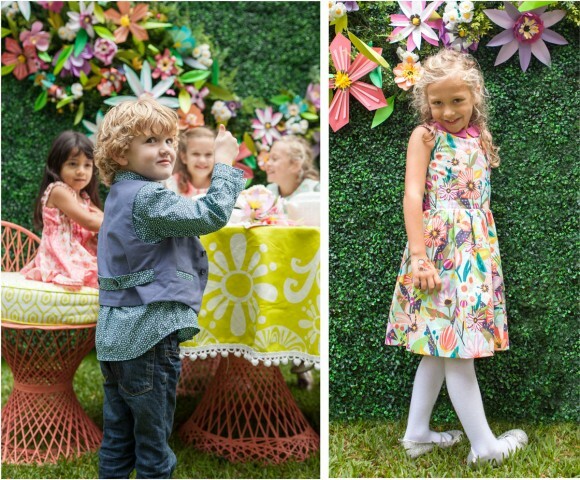 To see more of Iza Pearl Design’s Garden Party Tango please feel visit the Iza Pearl blog (specifically this post and this post) and see the complete collection of photos and fabrics at Windham Fabrics. The vivid colors and weather just can’t keep me from feeling good and full of energy. Spring is such a fabulous time of year. Not to mention the delicious Easter candy! Oh, spring! How do I love thee? In so many ways. I love the days getting longer. The fleeting green beauty of the foothills. Tulips and riding bikes in the sunshine. My favorite thing about spring are hyacinths and arugula! What a gorgeous collection! And I completely agree, it goes perfectly with Oliver+S patterns! My favorite thing about spring is seeing that first buttercup pop up in the most random of places, as if its only job is to bring a smile to your face and remind you warm, sunny days are on the way. Nothing makes me happier than seeing tulips bloom in the spring. Yesterday (as it began to snow) I looked outside and saw a beautiful red tulip and knew winter wouldn’t last forever. Hooray! I love watching everything start to bloom. And the warmer weather!!! It is so difficult to choose one favorite thing about spring! I love the sunshine through rain. I love the baby bunnies and lambs in the fields. I love fresh crisp asparagus! Tulips are my very favorite flower and they awaken in the spring. Morning tea on the front porch, as well as watching the children on the street. Easter brings joy and new dresses and Robin Eggs, my favorite candy. Oh, I just love spring! Spring is like the feeling of hope, longer days, blooming trees, flowers peeking up after a long brown winter. I especially love when all at once the trees decide to put out their green leaves and it feels like it happened overnight! My favorite thing about spring are the cherry blossoms. I love the new bright green and colors of nature, the return of warm weather and winter celebrations. What beautiful fabrics! I love shedding the bulky black and gray clothes for lighter happier colors and clothes, I love watching the earth come back to life and breathing in the cool crisp fresh air! Spring is just such a beautiful time of year, it just fills you with energy and hope! Love to hear the birds chirping in the morning and see the daffodils come up. I love being able to walk outside without thinking about what clothes I need to wear, short sleaves and sandals is about it. I love the longer days. I feel like it’s possible to get so much more done. We are still under three feet of snow but my favourite thing about spring is when the kids reappear to play on the streets of our neighbourhood. p.s. I’m in Canada but I’m sure my in-laws would receive this for me if I won. thanks for the chance! My favorite thing about spring is being able to spend more time outdoors as a family. It’s healthy, educational, wonderful bonding time and makes me grateful to live where we do. I just love seeing the new green shoots pushing through the dirt in my flowerbeds, and the first buds! Also, the longer days and my children running back outside again to play after supper until time to get ready for bed. I love all the fresh flowers and new produce coming into season! I love when the weather is just starting to change, brighter, bluer skies, but still a chill in the air. I love winter, but I am so over it this year– Bring on Spring please! I love hyacinths– I have them planted near my door so I can smell them whenever I come or go. 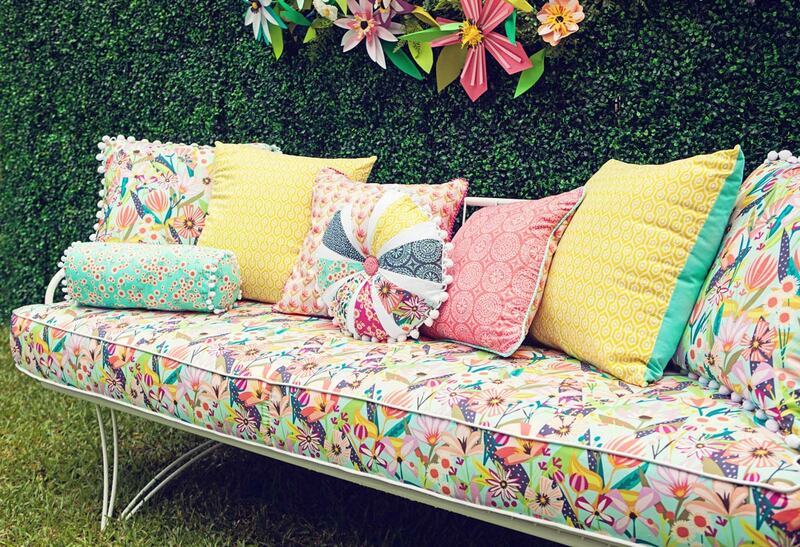 These fabrics are just what we need to celebrate warmer weather. What I love most about spring is that I get to start gardening, mowing the grass (which I love to do, and I know that this makes me weird), and chances to go camping with my family. Spring break! Blossoms on trees! Tulips! I love spring! I especially love the wildflowers and warm weather!! I like warm weather and flowers start to bloom. It becomes very colorful and spring feels great. All the gardens coming back to life! It seems like a sweet surprise every year. Thanks for the great giveaway!! I love walks and bike rides at the parks with our kids… I love that even while I am working inside I can have the windows open and feel like I am still enjoying the outside 🙂 I love the wonder of planting our seeds for the summer garden. I love starting my vegetable garden — so much promise in the spring without all the summer weeding yet to come. Texas wild flowers in the spring make my heart sing, especially the blue bonnets. Can’t wait to get my hands on yardage of Melissa’s fabric. The best thing about spring is the longer days and the perfect weather for playing outside with my kiddos! And allergy medications that work, and a week off of school, and the end of flu season! My favorite thing about Spring is the sound of bird songs mixed with the appearance of blooming flowers and trees. Tulips! Tulips! Tulips! My absolute favorite part of spring is the tulips! I also love that my kids can play outside again (though I don’t love the mud they track in)! My favorite thing about spring is seeing all the colors after a drab winter! I love the flowers and freshness of spring! Being able to get outside! We’ve been cooped up by snow and ice, and I can’t wait to get out to a playground with my kiddo. I love the bright green buds that pop out everywhere. It’s such a great change from the winter landscape! Getting into my potting shed where the spring sun raises the temperature inside before it does outside, Here in New Hampshire, spring seems to come so late (We currently have at least a foot of snow on the ground and 5 foot high piles.. Every drive south, even 30 miles, and they are at least 2 weeks ahead of us! My favorite thing about spring is the return of green: leaves, frogs, you name it! I love that I am so excited to be back outside! Perhaps without the change of seasons I would get blasé about lovely weather? Fresh green leaves poking through the dirt and snow. My favorite thing about spring is getting back to the playground with my little girl. Watching her face light up as she swings while my toes are happily wriggling free in sandals is the best! My favorite things about Spring are daffodils, warmer weather and the smell of rain in the air. I love planning and planting a veggie garden in Spring. I love the golden blooming Tabebuia trees – beautiful!!! this photo shoot is my favorite thing about spring!! what gorgeous fabric!!! What I love best about Spring is the green things starting to grow…and being able to be outside again. What I love most about spring is first sign of new life in winter. Green buds on trees, daffioils, tulip shoots. It give me a feeling of “fresh start” each year. The honeysuckle blooming in my backyard! In February, in northwest Florida, the first signs of spring are the pink blooms on the Japanese magnolia trees. Seemingly overnight the blooms appear on the bare branches. They can last for a few weeks, if a freeze doesn’t kill them. It’s treacherous to bloom so early. The leaves start to grow after the blooms have faded. The trees remind me that life is returning to our landscape. I love this line of fabric. 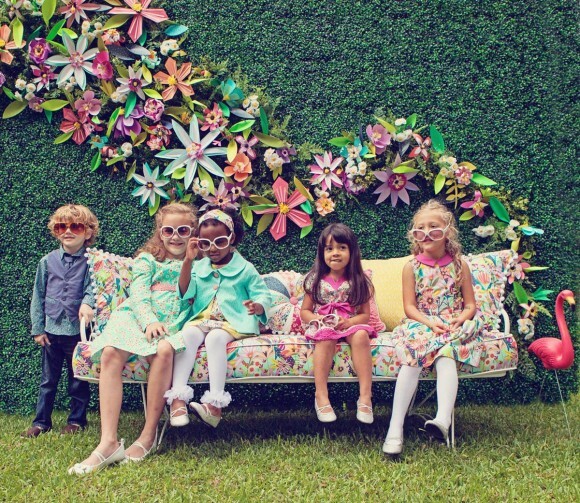 My kids need some new stuff for spring! Thats one thing I love about this season, changing everyone over from coats and sweats to sundresses and swim suits. I love the colors of spring and the beautiful flowers that start to bloom. I just saw Pansies at our local garden shop. These flowers just seem to smile at you. Favorite things about spring: longer days, digging in the dirt, hunting for the first shoots of green coming out of the ground, and of course, the warm weather! what beautiful fabrics—would love to win some! Daffodils! Second only to tulips, irises, and crocuses. Oh who am I kidding? I love them all! Flowers are my favorite spring happening. Spring means being able to run outside comfortably. Longer days. Warmer days. Still cool nights. Spring flowers. Least favorite is the sneezing that comes with all the above! I love the dogwoods and daffodils! Thanks again for the giveaway. My favorite thing about spring is the longer days coupled with beautiful sunshiny weather. I love watching the trees go from cold, sharp, and brown to soft shades of green and blossoms. I love having it be light outside all the way through dinner! It feels like such a big change when we turn the clocks ahead! Hmmmmmm… Cadbury eggs, marshmallow peeps, pinstripes on seer sucker fabric, Peter Pan collars on Easter dresses and bluebonnets. I LOVE spring! The aroma of spring is my favorite part. I’ll bet you didn’t know that Easter grass has a smell, but it does. I love the smell of rain in springtime and dirt bursting with happy flowers awakened by the suns warmth. I love the earthy smell of freshly hatched baby chicks and a child’s hair after playing outside. Spring awakens the senses not just visually and audibly. Every scent of spring is a feast and a memory. I love the smell of the earth waking up! Can’t wait to see what comes “up” in the flower beds. My favorite time of year. My favorite thing about spring is the warmer weather and leaves suddenly popping out on the trees! I love the warm weather after months of cold. My favorite thing about spring is probably the flowers blooming; tulips, azaleas. Seeing color after months of grey is so wonderful. I’m so excited about the flowers and flowering trees, and starting to go back outside. In the Pacific Northwest it’s so nice to see colors other than gray or green! Spring finally brings a contrast to the months and months of gloom. My favorite for Spring is making pretty Easter dresses for my dgds. I love to look at the past years photos and see how they have grown. I love watching my backyard change from brown to green! I love the bright blue sky and sparkling sun, start of baseball season, sewing an Easter dress for my daughter and so, so much more! The bold blue of sky bursting out… The neon green of new budding branches… Catching the last of the cool breezes that meld with the warm sun in a swirl that lifts spirits and spreads smiles. I love the longer days that spring brings! I love the warm sunshine and bright flowers that breathe new life and fill me with energy. All my plans and ideas seem possible and life is full of potential in the spring. And summer dresses for my daughters are so fun to sew! Our yard has three lovely Japanese cherry trees, and my, when they bloom, it feels like Easter for a week! Spring means afternoons outside, barefoot living here in South Carolina, and the occasional headmaster’s holiday. Those are lovely photographs and some beautiful fabric- I’ll have to see if I can find it locally. My favorite thing about spring is the colors- green grass, bulbs, and the extra light in the day. My favorite thing about spring is the excitement I see in my young children as they discover the crocuses blooming in our yard. That, and Girl Scout cookies! Pink tulips freshly cut, overflowing in a vase, necks gently bent. Congratulations to Laura whose entry was selected by Random.org as our winner. Laura said, “I love the longer days. I feel like it’s possible to get so much more done.” Laura, someone from Iza Pearl will be contacting you shortly to coordinate your prize.